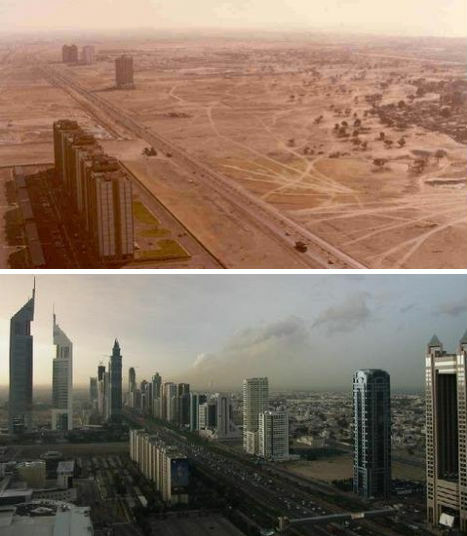 Twenty-one years ago, Dubai was a desert. It sprang up seemingly from nothing into the lively and technologically advanced world-class city that it is today. 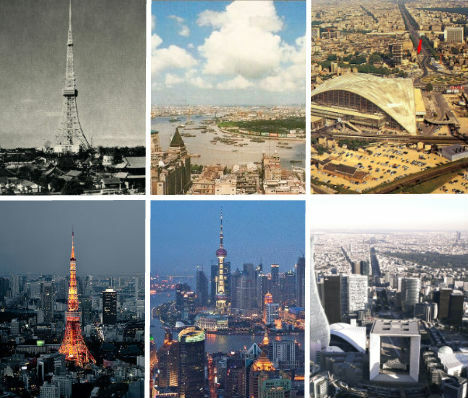 This is just one example of the dramatic speeds with which cities can change, sometimes rendering their skylines virtually unrecognizable within decades. Given the dramatic, jaw-dropping difference between these two images, you might be tempted to think that the top one was taken sometime in the middle of the 20th century. You’d be wrong. That image is from 1990. 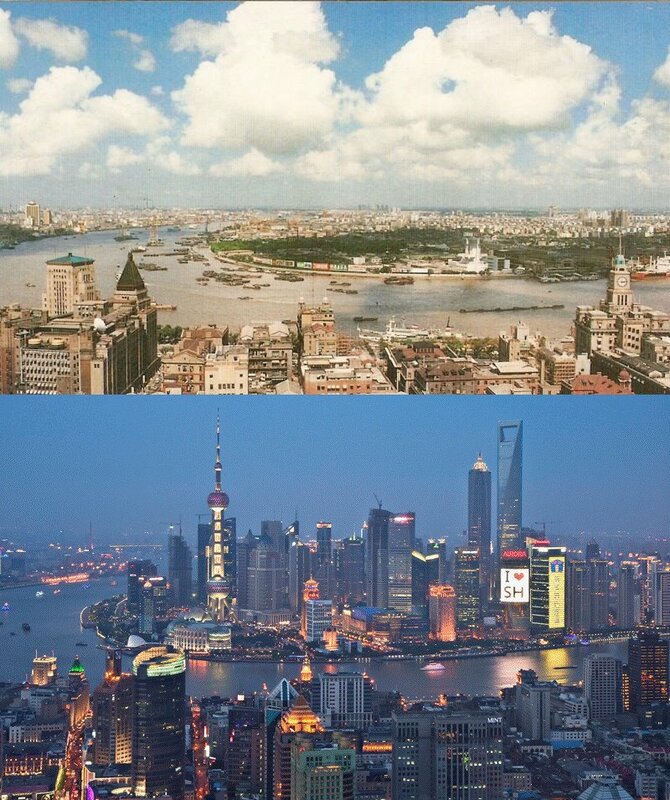 Shanghai is a stunning example of just how fast cities can rise up into bustling modern metropolises. These three photographs depict the same street in Dubai, progressing from a few lone buildings in the desert to the jam-packed, seemingly perpetually-under-construction ode to excess that it is today. 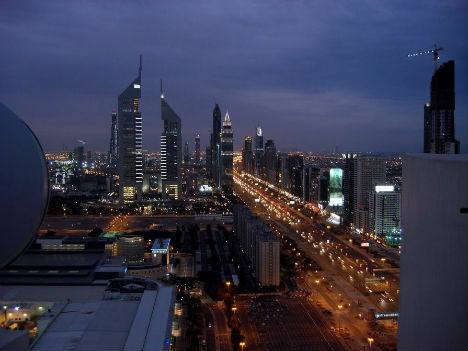 As a matter of fact, that most recent photo was taken in 2007, and the street has undoubtedly changed even more now. Imagine what it would look like if the recession hadn’t slowed down the frantic pace of development! 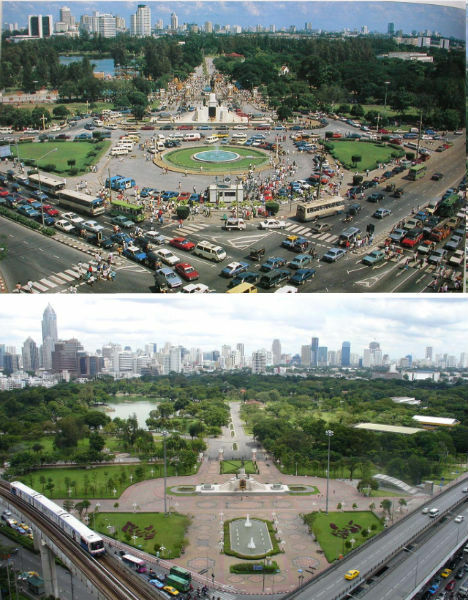 In 19 years, the view of the skyline from this end of Bangkok’s Lumpini Park underwent quite a transformation, blossoming with high-rises even while the greenery in the foreground stayed mostly the same. 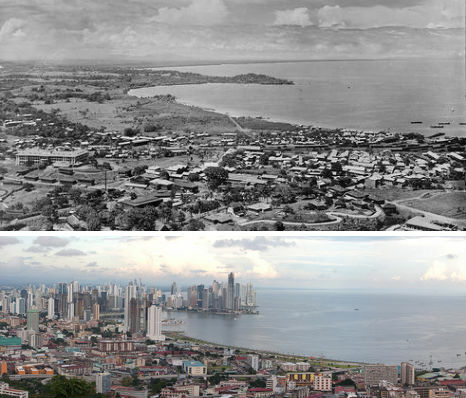 Panama City is one of the fastest-growing urban areas in the world, and these two photographs show a sharp contrast between two eras. The city sprouts from a quiet village into one of the fastest-growing urban areas in Central America. London has gained a number of high-profile, flashy modern buildings in the years that have passed since the 1970s. 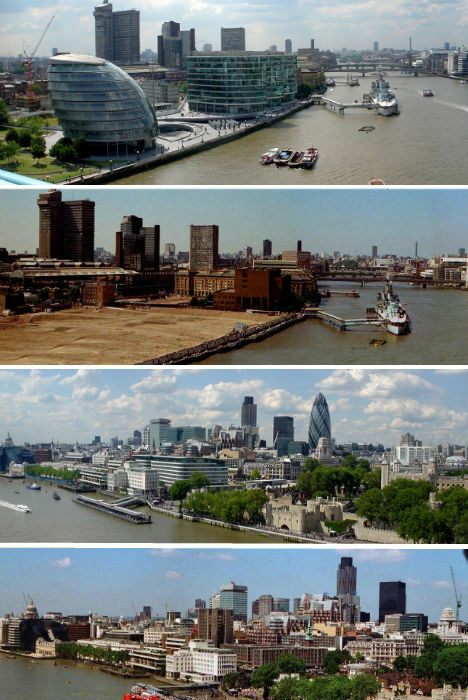 These four images depicting the banks of the Thames then and now, and a few glittering examples of modern architecture stand out, including City Hall and 30 St. Mary Axe (known as ‘the gherkin’), both by architecture firm Foster and Partners. 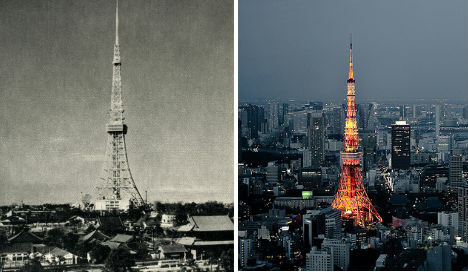 The rapid rise of Tokyo is certainly evident when comparing two images of Tokyo Tower, one taken soon after the tower was built in 1958 and the other captured in 2010. Once nestled into a landscape of traditional Japanese buildings and trees, the tower remains an eye-catching landmark, but its surroundings couldn’t be more different. Below that, an incredible time-lapse video shows the evolution of the Shinjuku district over 35 years. Urban Age :: São Paulo Film from OutrosFilmes on Vimeo. Even in 1954, you could get a feel for just how large of a city Sao Paulo would one day become – as in, largest-city-in-the-southern hemisphere huge. 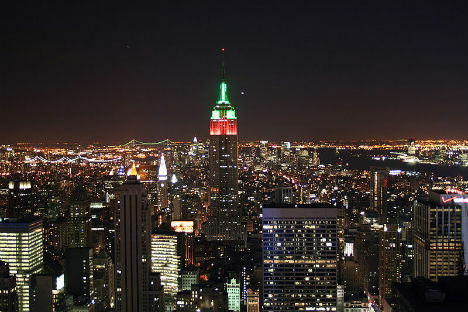 It’s also the world’s 7th largest metropolitan area, with nearly 20 million inhabitants. These two videos capture the realities of the city in two very different eras. 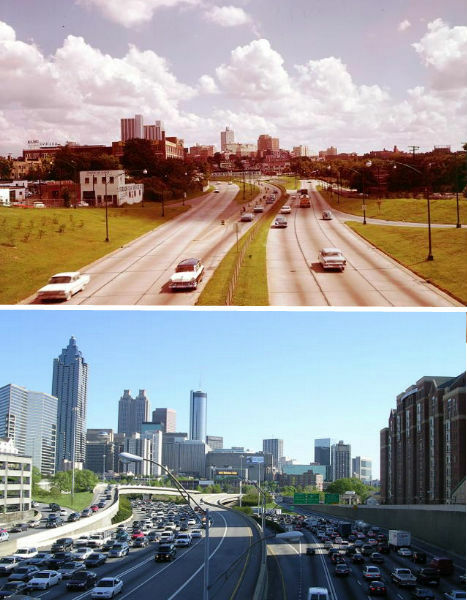 The view of Atlanta from the North Avenue bridge over the interstate has evolved dramatically since 1964, as downtown development has spread further and further out from the epicenter of the city. This southern city is notorious for its urban sprawl, partially due to the fact that it has no geographic boundaries like waterways or mountains to keep the city’s size in check. 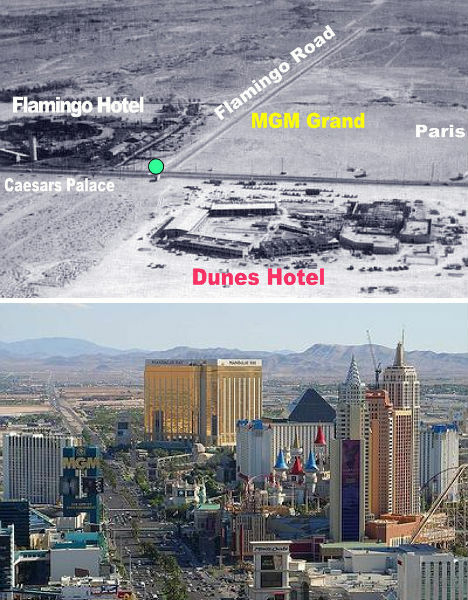 It didn’t happen quite as quickly, but the changes in Las Vegas – evident here on the Las Vegas Strip – are almost as mind-boggling as those in Dubai. The gambling mecca of the Nevada desert went from a mere stopover on the pioneer trail in the 19th century to a popular gambling destination in the 1930s before shooting up into the neon metropolis it is today. Paris is the kind of classic city where you don’t expect to see Shanghai-style, blink-of-an-eye changes. 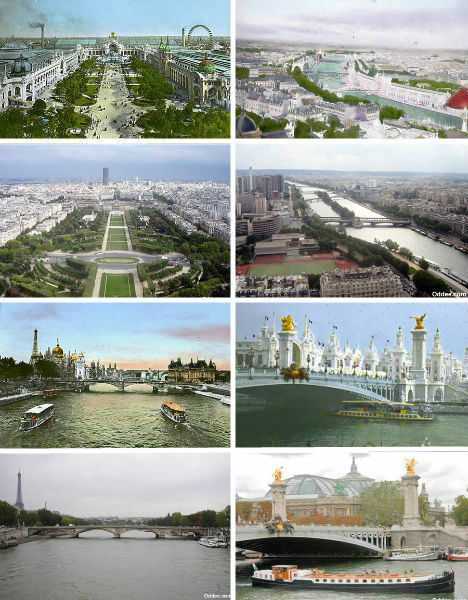 As it is in many historic districts around the world, in over a century, little has changed in the top Paris images other than the growth of trees. That’s not true everywhere in the city, however. 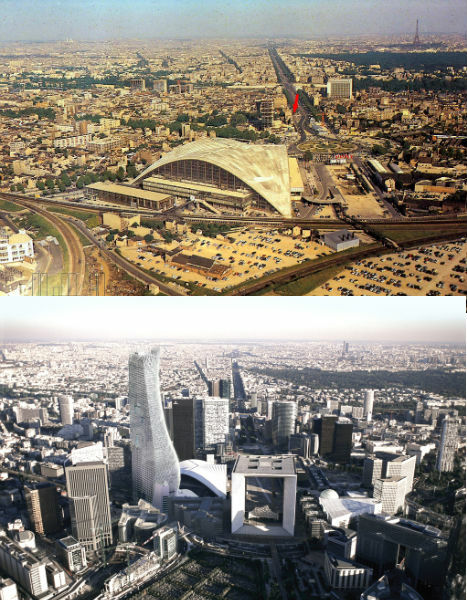 The bottom two images show the same view of the business district of the city in 1960 and 2006 (with a rendering of the controversial as-yet-unbuilt Phare Tower, the tallest building), with the Eiffel Tower in the background. 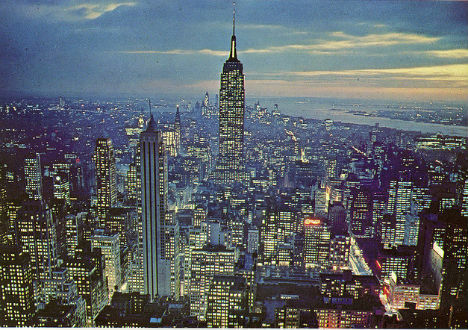 Wouldn’t you think that the Midtown Manhattan skyline would have changed more than this over six decades? 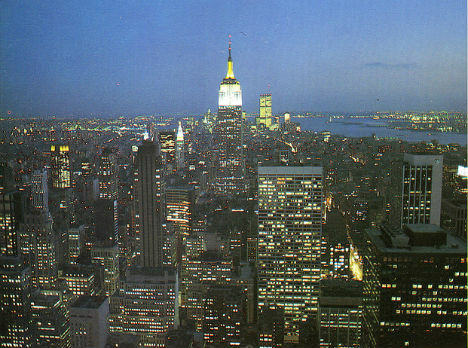 In 1954, many of the buildings that still define the skyline today were already in place. 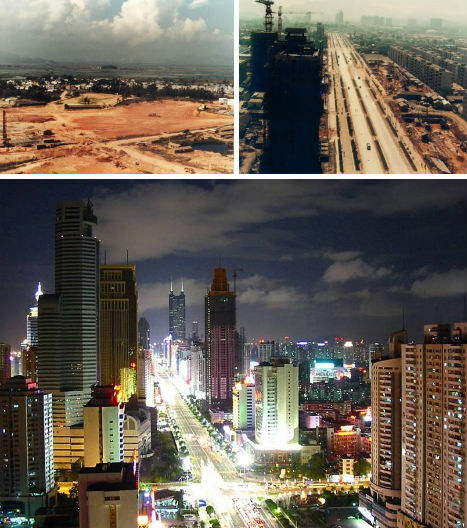 While it’s clear that many buildings sprouted up by the time the second photo was taken in 1985, it’s not a dramatic change, and even less so between then and 2009. The fastest-growing city in China (and possibly the world) was nothing but a tiny fishing village as recently as the 1979. An influx of foreign investment spurred growth so rapid, the city seemed to change every single day. Today it’s a boomtown with 12 million residents. See the whole 25-year progression at Skyscraper City.